Discussion in 'TalkCeltic News' started by Officer Doofy, Apr 29, 2018. The surprise inclusion in the Celtic line-up was Odsonne Edouard, the man who struck the winning goal only a month ago at Ibrox. Moussa Dembele missed out through injury, which paved the way for his fellow Frenchman to get his first start in this fixture. He was the only change from the team that hammered Rangers 4-0 on April 15th. It was expected that Rangers would come out fighting after their dreadful display two weeks ago, however they could not get close to their opponents in the early stages. The early Celtic pressure paid off in the 14th minute. After some good work out on the left by McGregor, the ball fell to Tierney who skipped past Candeias and drilled a cut back straight to Edouard who only had to tap the ball in from 6 yards out. The Frenchman was off to a flier, and it was a sign of things to come. 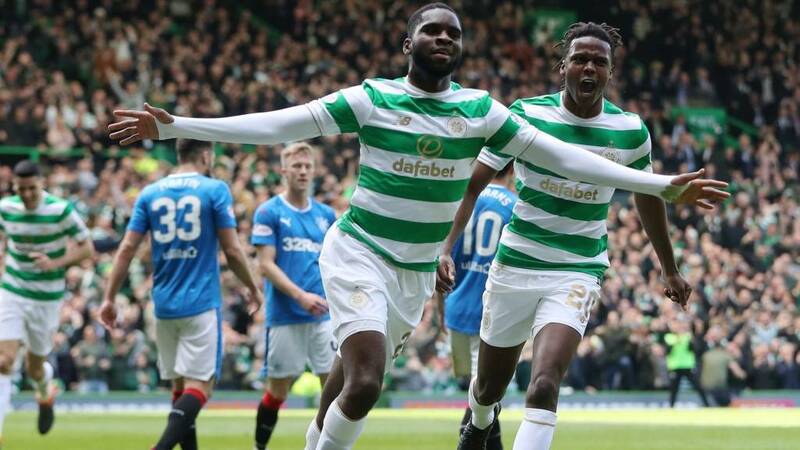 Celtic could have been 2 or 3 goals up within the first 25 minutes, however just as the tempo of the game had slightly dropped and the half was winding down, the second finally arrived courtesy of Edouard again. If the first goal was a tap-in, this goal was all about the directness and technique of the young striker. He received the ball 30 yards from goal, before driving at the Rangers backline and driving the ball across Alnwick and into the back of the net. It was 2 goals for Celtic and 2 goals for Edouard. It looked like it would be a commanding 2-0 lead at half time for Celtic, but then up stepped James Forrest. The winger had been lively throughout the half and topped it off with a magnificent solo goal. Starting out on the right near the sideline, Forrest jinked past 3 Rangers players before unleashing a strike into the bottom left corner of the goal. It was no more than Celtic deserved, and no more than James Forrest deserved in what has been a sensational season for him. The goal was his first ever against Rangers and boy did he enjoy it! The second half started in much the same way as the first half ended. Tom Rogic made it 4-0 on the 47th minute, after good pressure from the Celtic attack and slack defending from the Rangers backline. The ball eventually fell to Rogic at the edge of the box who only had to curl it into an empty net to put Celtic further in the lead. It was the fourth goal of the season for Rogic in this fixture who seems to loves the big occasion. It took only minutes for the lead to be extended yet again. Edouard, the scorer of the first two goals, turned provider this time. He received a pass from Rogic out on the left, before driving at Tavernier and, showing some nice footwork, skipped past the defender with ease. His cut back fell to Callum McGregor who, much like Edouard’s first, had a simple tap in to make it 5. The title party was well and truly in full swing. The remaining 40 minutes of the match provided no more goals, as Celtic took their foot off the gas and kept the ball, creating the odd chance here and there. Both teams made substitutions, and despite Rangers bringing on another striker to play with two up front, they never really looked like getting a consolation goal. It was yet another comfortable day at the office for Celtic in the Glasgow Derby as they confirmed their seventh league title in a row in the most satisfying fashion. Now with the league wrapped up, the next milestone is securing the double treble. CymruBhoy, Easter Rd Davie, Wee Jamesy and 5 others like this.